Over the next six months we will be switching all our sites to in-ear monitors. We made the move at our Production Site a number of years ago and we haven’t looked back. The clean looking stage and the clean sound both for the crowd and the band have been fantastic. But the transition is not always easy. In-ears take some getting used to. This is especially true for vocalists who will hear their voice in a whole different way, and often for more experienced musicians who have grown accustomed to performing with stage monitors. By some miracle of providence, I’ve been involved in transitioning bands from wedge monitors to in-ears four times in my career. As a musician and a tech, I’ve experienced both the stage and the mixer, big venues and small venues, big bands and small bands. And I am a big fan of in-ear monitors. I have some ideas for easing the transition and getting the most out your monitors. In-ear monitors are headphones that block your ear canal, isolating your ears from the sound in the room. They allow for a more controlled and clear sounding monitor mix, which enables you to perform live with at a much quieter — read safer — level for your ears. 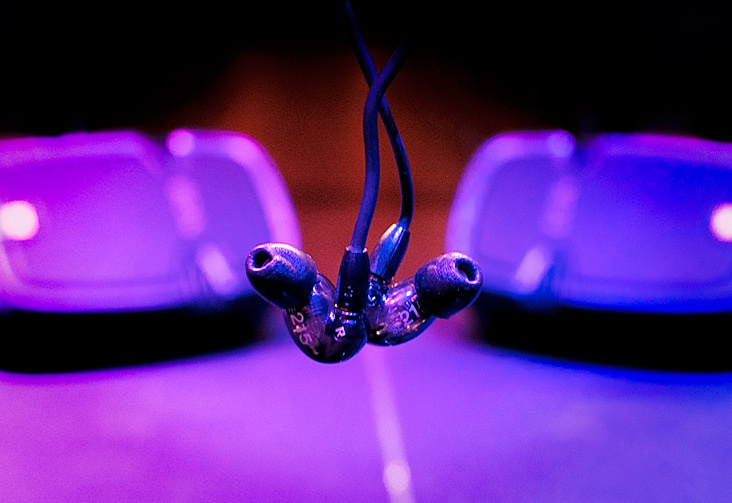 By replacing loud stage monitor speakers with tiny earbuds, the sound bleeding from the stage is greatly reduced, along with the risk of feedback. These are huge advantages. From a purely technical perspective there are virtually no disadvantages to in-ear monitors, so they tend to be a strong preference for audio people. Although still a very popular choice for musicians too, in-ears have both pros and cons for those on stage, as they affect the experience in a significant way. In-ear monitors can contribute to musicians feeling isolated from each other, the crowd and the room. The clear but blunt sound can be uncomfortable at first, as you adjust to hearing your performance in a raw and sometimes unflattering way. I’ve worked with over a hundred musicians on the transition to in-ears, from amateurs to seasoned pros in big and small venues. Nearly all of them grew to love the in-ear experience, or at least grow accustomed to it. I myself can hardly stand to play with an open-air monitor any more! So let me reassure you that, while you may experience a learning curve, in-ear monitors are nothing to be afraid of. On that note, I have a few pointers to help you through this upcoming “awkward phase”. 1. Stick them in your ear(s). In-ear monitors go inside your ear. They should sink down in there and completely occlude the ear canal. In fact, to get them seated properly you sometimes have to tug your earlobe upwards and go in on a slight angle. It can be uncomfortable at first, but if you don’t have them in properly they will not sound very good. In-ears come with a selection of tips in a variety of sizes and materials. Spend some time choosing ones that give a good seal in your ears. Usually foam tips outperform rubber ones, and if you’re really serious, you can have custom molds made for you by an audiologist. 2. Singers, get ready for some honesty. Compared to open air monitors, in-ear monitors are very accurate, and very isolated. They are much closer to an ideal critical listening environment and, as a result, you are likely to hear things you didn’t notice before. Singers, before you utter the common complaint that “these in-ear monitors are throwing off my pitch”, please take a moment to consider that the problem may lie elsewhere (and your audio tech checking your channel with his headphones has known this for some time). Nobody likes listening to their own voice, at first. The good news is, I have heard from a number of singers who harnessed the honesty of their in-ears to actually improve their control over pitch and inflection. I place myself in this camp and it’s the main reason I don’t enjoy singing with wedge monitors. Pitch reference – especially crucial for singers, winds and strings who rely on others to find their own pitch. To lock in a pitch reference, make sure you have fixed-pitch instruments like keyboards and guitars in your mix. Time reference – valuable for everyone, but especially rhythmic instruments like percussion and bass guitar. For a good time reference, listen for percussion, bass as well as any click or rhythm tracks if you are using them. Cues and transitions – there’s nothing worse than starting into one more chorus just as the rest of the band finishes the song! So if your song leader uses verbal cues, make sure you have them at a good volume in your mix. The same goes for count-in and transition tracks if you use them. A balanced mix – generally speaking, it’s good to hear all the musicians in your band. Look around during sound check and see if you’re hearing a balanced representation of your team. When it comes to your own instrument, there’s nothing wrong with having the level a bit louder than the rest, but I would encourage you to try to find a balance there too. You’ll perform best when hear yourself in context. The room – many musicians appreciate hearing some of the natural sound in the room. It helps the mix sound more natural, more connected to the people around you. If you have the equipment, this can be done by placing a microphone in the room, on stage or elsewhere, and feeding it into the monitor mixes. This is called an “ambient mic.” There are also some kinds of in-ear headphones that include a port to let in a controlled amount of sound from outside of the earpiece. Very fancy. I hope you come to love in-ear monitors as much as I do. If you have any other tips or tricks, feel free to leave a comment.